Jes is the head sculptor and miniatures director for Games Workshop. He’s been sculpting and designing miniatures for decades and has produced some of the most iconic science fiction and fantasy miniatures ever designed. He’s a tireless and dedicated artist who works in many mediums in that most practical of processes: turning ‘good ideas’ into something that everyone can love. Jes in many ways is a pioneer in his field. When he started at games workshop, the company was still largely producing generic fantasy and science fiction models. Together with Jervis Johnson and Rick Priestly, Jes spearheaded the effort that would give the Warhammer IPs both their most enduring images and the secret to their success on the tabletop. 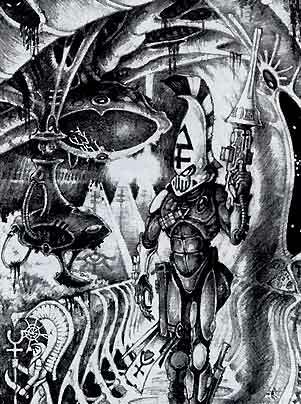 His enduring contribution was to give Warhammer’s existing factions, particularly the Space Marines and Eldar, their visual character, in a way that has set the model for all future GW design. Whether it was deliberate or not, Jes recognized the need for visual coherence and distinctiveness in a set of factions ultimately destined to be turned out in 3cm high pewter and plastic replicas. It wasn’t enough for them to have a few distinctions here and there. 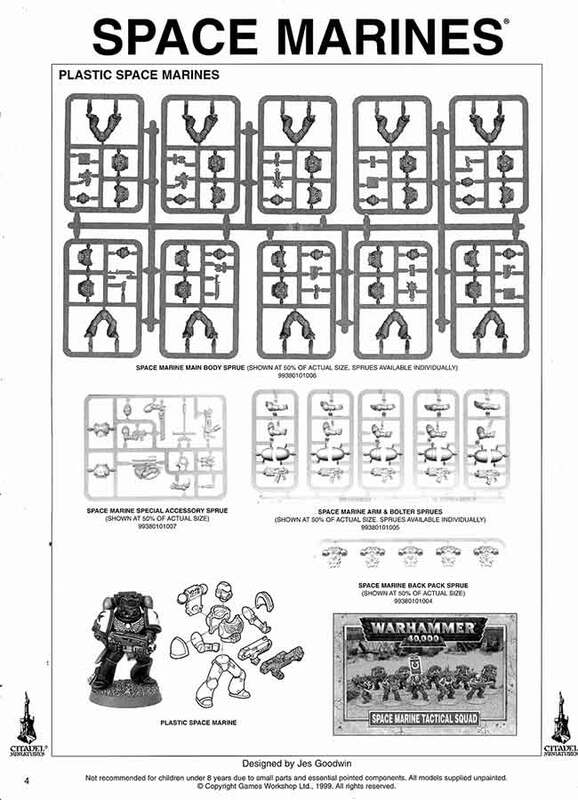 In an anticipation, perhaps even the source of the later videogame design idea of ‘silhouette recognition’, Jes set about giving the factions of 40k a look that would see them gain notoriety and serve as inspiration for a generation of artists, authors and game designers. 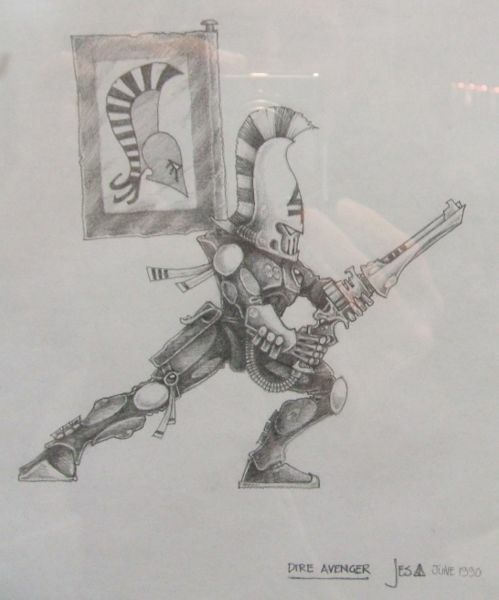 The ‘type specimen’ of the Space Marine, blown up from Jes’s sketchbook with the man himself in attendance, is the first that clearly describes the silhouette of the marine (though note that these elements existed pre-Jes, he merely refined them). Heavy yet sleek curved armor plate set off by huge armored pauldrons, a massively exaggerated chestplate emblazoned with a huge relief insignia. Menacing helm with a slanted brow. Plenty of real-estate for customization. Plenty of inherent menace. Instantly recognizable. Jes applied the same methodology to ensuring that everything associated with the marines, weapons, vehicles, relics and more, fit coherently with this vision. The result was a fictional faction which at once is ludicrously overblown and desperately real. Most importantly, Jes’s Space Marines were a hit on the tabletop. It gets better. Having pioneered such an iconic design in the abstract, Jes turned his hand to the practical side and, after a few years of development, released a kit that would literally revolutionize the tabletop wargaming hobby. The second iteration of the Space Marine tactical squad, released alongside Warhammer 40k 3rd edition in 1998 has proved so enduring it remains the basis for all subsequent Space Marine designs to the present day. Jes translated his elegant visual design into a modular kit that could allow a practically infinite variety of poses, alternate parts and additions. Affordable plastic Space Marines went from static, unexpressive statues to dynamic, expressive and easily customisable canvases upon which players could paint their stories. Underneath all this potential, Jes’s original design remained strong, giving each marine that unique, identifiable silhouette. All of these- the miniatures, the full artwork and the concept sketch are Jes’s. 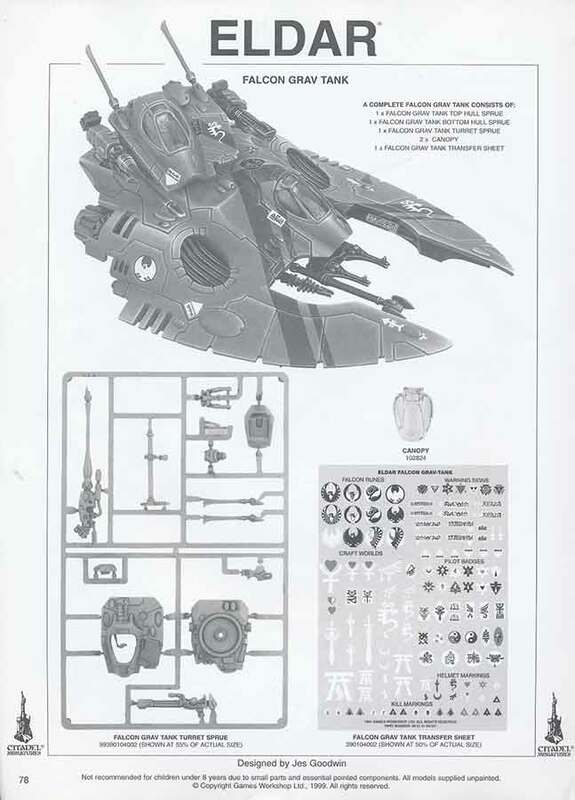 He also gave the Eldar their iconic vehicle design- the Falcon tank chassis, a kit that has endured even longer than his Space Marines- the falcon is still sold today, unchanged since it was released in 1997. 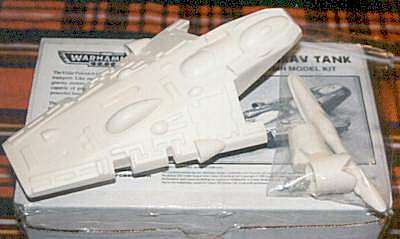 Compare this, if you will, to the previous incarnation of the falcon, a licenced model produced by Armorcast based on pre-Goodwin designs. Jes’s falcon has a unique silhouette and a design that echoes the designs of individual Eldar soldiers in every way, from the ribbed, flanged plates to the ubiquitous gemstones and oval casings. It’s also proved versatile enough to serve both as the chassis for a number of variant vehicles, and the spiritual inspiration for a line of heavier and lighter Eldar tanks. Jes further innovated in the design of the Eldar aspect warriors, castes of fighters defined by a particular mode of warfare. His designs for these miniatures gave each a unique silhouette granted by a particular visual element- a tall helmet crest, chainsaw-sword, heavily set leg armor and long weapons or hunched, multi-limbed appearance. The aspects both helped the Eldar develop a racial personality and narrative character, and make Eldar armies incredibly distinctive on the tabletop. A player can walk into a room and glance across the room at a gaming table. 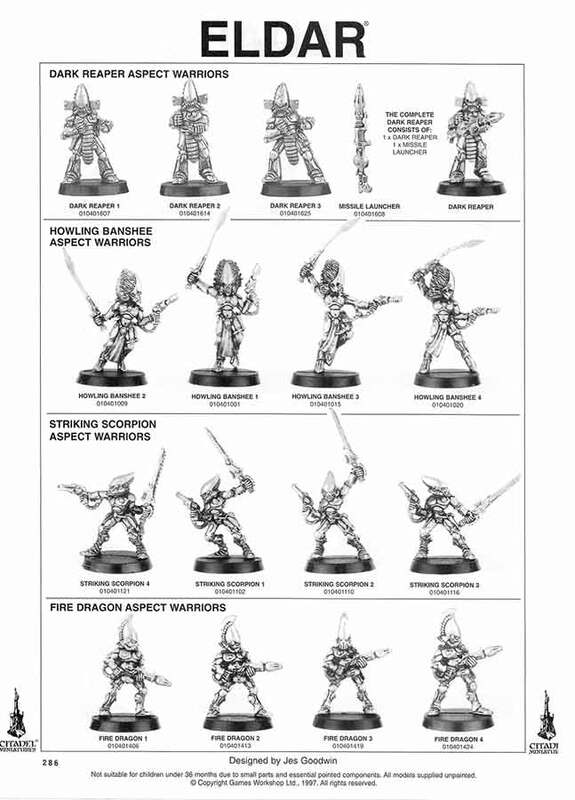 Once familiar with the models, in the space of a second they can easily identify an Eldar force and probably most of the different elements of which it is comprised. It is this factor that has made Jes’s designs so enduring. They are incredibly appealing and cohesive up close, but also thoughtfully designed for their intended purpose- toy soldiers on the tabletop. As you may have guessed, I’m a big fan of Jes. It’s mostly because he represents to me what it really means to be a designer- not only thoughtful and creative when coming up with ideas, but always pushing to turn those ideas into really interesting and viable products with a suite of highly developed technical skills and experimental process. To have both the level of inspiration Jes possesses and the skill to see it brought to life is a gift few can claim to own. To do it for over twenty years and still be constantly improving, having left a legacy of design that shaped the development of an entire community is truly inspirational. Jes’s work has taught me a lot of important lessons about how visual design can be accomplished. Designing things to be recognizable, coherence across associated elements (members of the same faction) while differentiating factions with fundamental stylistic variations (angles vs concave curves vs cutbacks vs overlaps vs convex curves etc). Telling a story about how someone acts or fights purely through their look and so on. He’s also influenced me in the way I go about developing entire concepts. Everything must serve a purpose, everything must mesh and not just aesthetically- the aesthetics must serve a role in practical terms too. Jess’s marine designs were ideal for customization, a fact that has made them overwhelmingly popular for more than a decade. 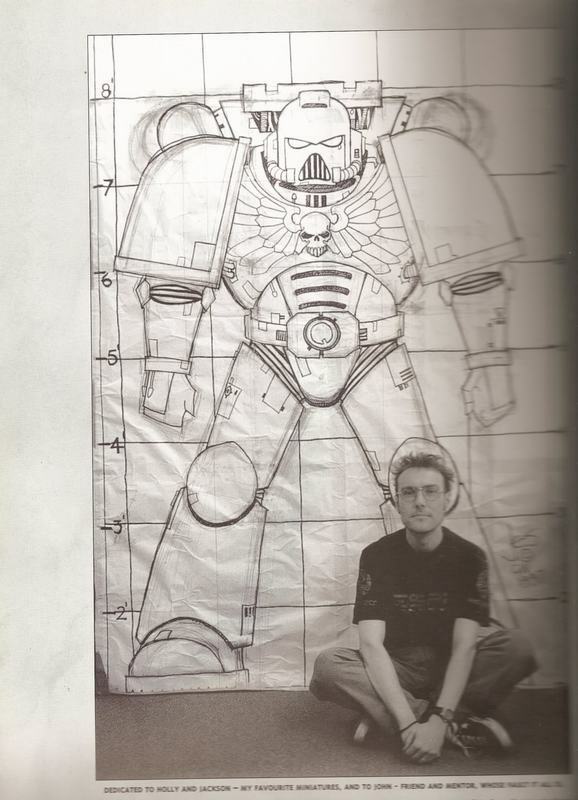 His implementation, not just the conceptual designs that supported it, was what put Warhammer 40,000 in the market leading position it is today. John Blanche should also be mentioned here too in relation to Goodwin. Blanche’s insistence on evocation (that Goodwin shares, no doubt! ), constantly referring to particular times and figures from history, as well as literature and art history, in addition to contemporary pop culture, really has set GW’s IP apart from everything else and gives it an unmatched depth, resonance and reality. Thank you and yes, I think Blanche deserves a lot of credit. Also thanks for the miniature thing. Awkward. I swear I read on the GW site about all the characters being Goodwin sculpts >.>. Will fix.